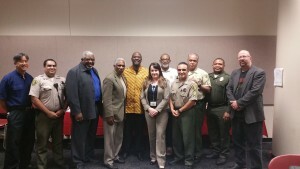 Faith leaders from Los Angeles and San Bernardino counties took a tour inside two of the Los Angeles County jail facilities led by the Rev. Dr. Art Cribbs, executive director of Interfaith Movement for Human Integrity and its Justice Not Jails program. Joining the delegation also from Los Angeles were the Rev. Kelvin Sauls, pastor of Holman United Methodist Church and Pastor Frederick Howard of Southside Bethel Baptist Church. Other faith leaders included the Rev. Mitchell Young, pastor of Montebello Plymouth Congregational United Church of Christ, Bishop Emory James, pastor of the Ephesians New Testament Church in Fontana, and Mr. David Gist, regional organizer for Bread for the World. According to Custody Assistant Omar Hopkins from the jails’ Office of Religious and Volunteer Services, more than 2,000 volunteers from faith organizations work with the staff and inmates every year. 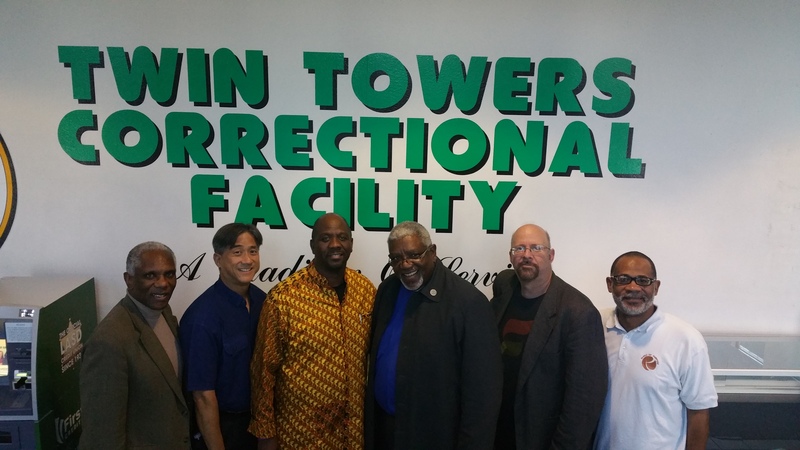 The faith leaders began their tour at the Men’s Central Jail where high security inmates are housed. Sheriff deputies say prisoners have been sentenced up to 10 years in the county jails. Approximately 17,000 men and women are currently held throughout the Los Angeles County Jail system. Prisoners are required to spend at least 3 hours a week outdoors. Inmates are assigned different colored clothing to distinguish either their level of crime and security or their self-defined sexuality. A pod for homosexuals and transgender inmates currently holds more than 160 prisoners inside the Men’s Central Jail. When asked about staffing, the faith leaders were told some deputies are putting in 48 hours of overtime every month. “It was quite an emotional experience,” stated Dr. Cribbs. “Although I have been inside numerous jails and prisons (city, county, state, and federal) around the United States and in other countries, this was the first time I have been inside the county jails in my hometown. I was particularly affected during the tour as we walked through the mental health floors where 3,000 prisoners are held.” The Los Angeles County Jail is the largest mental health facility in the country. Sgt. Paul Vargas from the Inmate Services Bureau encouraged the faith leaders on the tour to help bridge the gaps in Los Angeles County and address the need for mental health services. The faith leaders found a basis for agreement among the deputies about the need to increase social service resources. Although deputy sheriffs spend at least 40 hours in training to handle mentally ill inmates, they are not mental health professionals. Ms. Monica Turner is a psychiatric social worker with the Los Angeles County Department of Mental Health. She has worked at the Twin Towers Correctional Facilities for 11 years. “The jail is not a mental health hospital,” she told the faith leaders. “Inmates are not required to take their medications here,” said Ms. Turner. “When they come off their meds some can become very violent and dangerous to themselves and others,” she said. Every mentally ill inmate is evaluated and assessed whether or not he or she poses a threat to him or herself. Every precaution is taken to prevent the suicidal-prone prisoners from taking their own lives. The protocol includes having some inmates wear a type of gown that cannot be shredded, ripped or torn to make a noose. The guards scan the cells every 15 minutes to make sure the prisoners are alive and okay. Captain Strange is an advocate for proper mental health facilities and services. He also is concerned about the safety and well-being of members of his staff. “This past week we had three incidents of ‘gassing’ and we had our deputies put at risk,” he explained. Gassing is a term for an assault against the officers by mentally ill inmates who used milk cartons filled with human waste to spray on deputies when they approach jail cells. “When the officer checks on the prisoner, an inmate can smash the milk carton against the cell door and gas the officer,” Captain Strange described. Reflecting on the tour, Dr. Cribbs said, “The real depressing aspect of the visit was realizing jail is no place for the mentally ill. But, there are too few alternatives in the State of California.